Baltimore Ravens to sign John Brown. 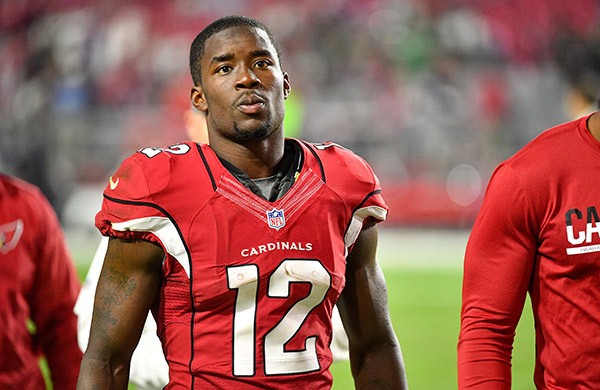 The Baltimore Ravens and former Arizona Cardinals wide receiver John Brown have seemed to reach an agreement. The Baltimore Ravens have been very active in engaging in talks with free agent wide receivers but were able to land none thus far in free agency. Brown, 27, is a talented receiver with great ability to stretch the field, something quarterback Joe Flacco knows how to do. The main drawback with “Smokey” Brown is his injury history. Brown has sustained numerous injuries throughout his career, always derailing production. When healthy, Brown is one of the league’s best burner receivers, but that’s only when healthy. According to NFL Insider Adam Caplan, the contract is a one year, $5 million deal, with incentives. The incentives make the deal worth up to $6.5 million if Brown was to cash in on all of them. The $5 million price tag is slightly higher than what I was hoping the Ravens would get Brown for. (I was hoping for it to be around $4 million.) However, the team had to pay to get him, as Baltimore was rapidly losing ground in the free agent market. The team’s wide receiver unit currently boasts standouts such as Breshad Perriman, Jeremy Maclin, and Chris Moore. So obviously, someone needed to be added. If John Brown can stay healthy in 2018, he could become the steal of free agency, but if not, it will only be another disappointment by a Ravens wide receiver. The Baltimore Ravens are nowhere near done in free agency. The team will likely continue to target the remaining wide receiver targets, including Mike Wallace, Jordy Nelson, and perhaps Tavon Austin. The Ravens will also likely attempt to retain Center Ryan Jensen. Jensen may be looking to make big-time money this offseason, and the Ravens will have to play catch up on that front. By adding John Brown, though, the Ravens have put one piece in place to the jigsaw puzzle that is the Ravens offense.